When I was younger and I thought of a "handy type person," I typically conjured thoughts of people like Tim "The Tool Man" Taylor. His caricature represented the gold standard in avid hobbyists that throw caution to the wind, often suffering the nearly disastrous affects of their ill fated attempts to rewire, rebuild, or reconfigure just about anything. Home Improvement's characterization of the bumbling but well intentioned buffoon is entertaining, sure, but it's also the person I've least wanted to be when dealing with my own home projects. Whether I'm attempting to execute a project to my fullest ability without taking unnecessary shortcuts, or I'm trying to make sure I practice the best possible safety procedures to protect myself and my home while working, I'm always keeping my eyes open to see if there's possibly something I could be doing better or more effectively. For a constant DIYer I tend to be a little bit paranoid. This doesn't mean I don't attempt something because I fear the outcome, it's quite the contrary. I actually feel like we can do more or less anything given the proper research, consultation, preparation, and occasional helping hand. 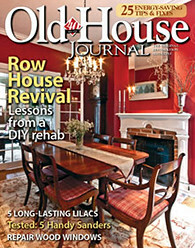 Over the years we've surprised ourselves at some of our accomplishments, sometimes looking back on projects and saying "did you ever think, when we bought our house, that we'd be able to..." But this hasn't been without its fair share of accidents and missteps along the way. Many times the success or failure of a project can come down to the know how, patience, and tools necessary to fully execute a task. But most importantly, more than owning the right tools, or having the right plan, being aware of the inherent risks of any project and how to properly mitigate those potential disasters are two of the most important things we, and you, can do as a DIYer. A few weeks back I provided a tutorial on sweating a copper plumbing joint using solder and a blow torch. As I mentioned, this is one of those intimidating home tasks that many shy away from due to the risks associated with the use of a direct and high intensity flame, often in wall cavities and other tight spaces within your home. This is actually one of those tasks when I believe, if you're not a little nervous or worried, you probably shouldn't be doing it yourself. Even a seasoned pro, no matter how sure of themselves they may be, should still have a game plan in their head just in case things go awry. A little bit of concern and preparation goes a long way to help ensure your and your home's safety. In our case, we recently took notice of our fire extinguisher while cleaning our the under sink area during our prep for our water filter installation, and realized it was probably about time to replace this safety device, just in case. Our trusty fire extinguisher is a device that every home needs, regardless of the level of DIY prowess the home's owners may possess. It's actually recommended that every home has at least one primary extinguisher per floor of the home, as well as secondary extinguishers in areas prone to more specific fire hazards, such as the kitchen or garage. We've had our single extinguisher that we purchased way back in 2003 when we moved into our house, and it's been nearby any areas of fire risk since very early on, but I never realized we needed more than one until I started to research replacement. We decided to take this opportunity to properly outfit our home with additional extinguishers in the basement and on the second floor of the house. You never know just when you might need one, and you never want to be in a position when you absolutely need one but don't have one on hand. If you already have one or more extinguishers, there are a few guidelines to determine its useful life. The typical small chemical fire extinguisher should be checked for pressure and seals annually. As long as the meter is in the middle to upper half of the green, and there's no visible signs of leakage, you are in pretty good shape. If your extinguisher is still going strong after 10 years and you've not had to use it, thank it for its service as it should be replaced and retired after a full decade (most are warrantied for 10 years). You can typically turn them into your city's hazardous waste disposal center where they can properly discharge and recycle the cylinder. Larger and more professional extinguishers are drained and inspected every 10 years, then refilled if all tests pass. This simply isn't practical for the small home extinguishers, so replacement is best. 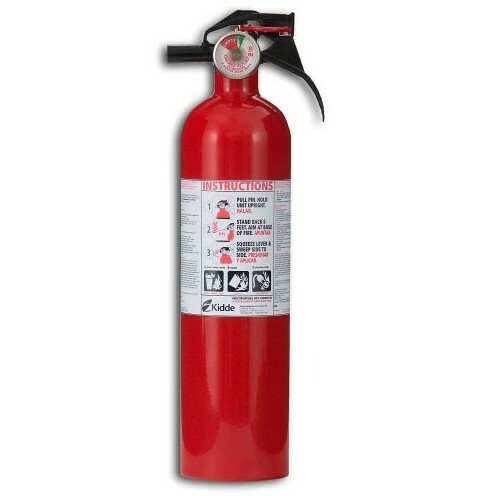 After a significant amount of research on both Amazon and other fire safety websites (such as the US Fire Administration and the National Fire Protection Association) we determined a few specific needs for our situation, and what we were looking for in a home extinguisher. When we were researching the options for our purpose we had two primary criteria in mind. First, anything we purchased needed to be suitable for fighting any class of fire. There are actually three primary classifications of fire: Class A (wood, paper, and trash), Class B (liquids and gasses), and Class C (energized electrical equipment). 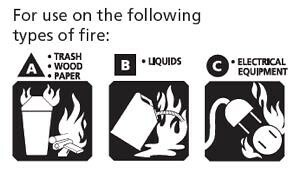 You'll see the ratings on most fire extinguishers, often listed as "ABC" or "BC". Secondly, any devices needed to be small enough to easily store, retrieve, and use in an emergency. As is typical, we turned to the various reviews on Amazon, as they seem to have a fairly comprehensive listing of available fire extinguishers. The final models we settled on are two distinct models under the well respected Kidde brand. Choosing a fire extinguisher is actually a little bit strange. You're choosing something based on options and decisions under the hopes that you'll never actually have to use it, but if you do, that it will work as you'd expect. For our kitchen model we chose a unit with a simple plastic nozzle and pin. My thought in selecting this is due to the extinguisher's location in our home. If we have a fire in the kitchen there's a good possibility that you won't have two hands available to operate the extinguisher. The simple nozzle allows you to use one hand to discharge the extinguisher while allowing your other hand to do whatever else you need. The second set of extinguishers we chose to be our primary extinguishers on each level of the house are a slightly larger version with a rubber discharge hose attached to metal controls at the top. One of the things I read while looking through the various items related to choosing an extinguisher stuck with me and heavily influenced my decision to select this extinguisher over other less expensive models. 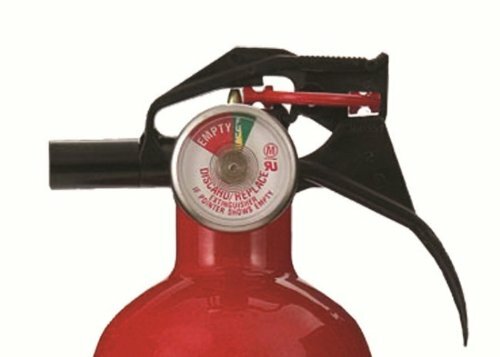 A reviewer on another model noted that he had an extinguisher fail on him when the plastic handle and nozzle broke while trying to open it for use. He had another metal handled extinguisher in another room and was able to retrieve it for his needs. From that point on, he swears by the use of extinguishers with a metal handle only, rather than a version that could theoretically fail more easily. The controls for the extinguisher we selected are metal and seem to be of a "heavier duty" than the simple plastic controls. Adding the rubber hose to the discharge and you can use this extinguisher to better direct the suppression chemical right where the fire happens to be, regardless of the odd angle or tight space that may have otherwise stood in your way. Overall this purchase is hopefully more peace of mind than anything else, but now we know we have what we need on hand if we happen to have a fire in our home. (Knock on wood.) In all we spent about $100 on all of our new extinguishers and given the useful life of each that hopefully means $10 of insurance per year. It's a small price to pay in the event we ever have an actually need for one to fight a fire in our home. 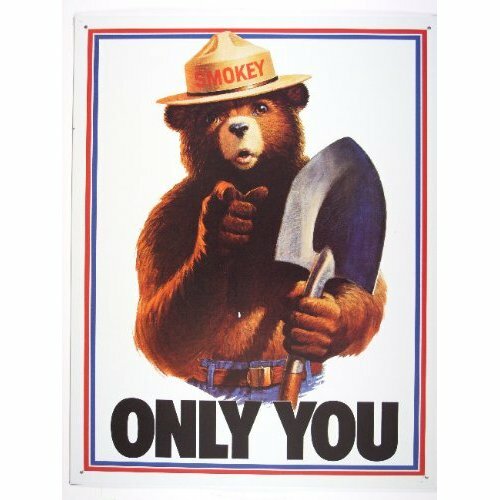 Though it isn't a forest fire that we're fighting, we still hope Smokey would be proud of us. What are your home's fire fighting plans? Do you have multiple extinguishers available in the event you need them, or is it something you need to pick up? 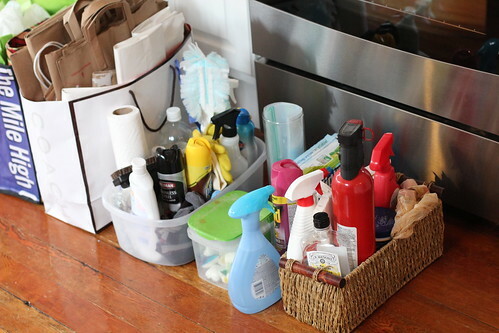 What other items do you have around your house "just in case?" A fire ladder? A built in sprinkler system? Maybe something else? We'd love to hear. Where will you be keeping them? Will they be something you have to decorate around or are they tucked away somewhere? Great question, Cheryl! We keep our kitchen fire extinguisher front and center under our sink. We haven't yet determined a location for the upstairs one, but I'm leaning toward having it out of sight, but easily accessible as well (maybe hanging on the back of the hall closet door). The basement is always a visual mess, so this one will live in a prominant and visible location. OMG that montage was hilarious. I'm pretty sure I've seen 95% of those episodes, too. Our thoughts exactly on the fire extinguishers. It's something you don't often think about until you really need it. Which reminds me, I should re-read the directions on how to use it to be sure in a pinch (or in the dark), I could operate one without issue.